Bathroom situation - one large & cleanly unisex unit on the street level. Downstairs, the usual complement of grubby Ms & Ws (1 each). For some reason the street level one is frequently vacant. This is either cuz the folks here just drunkenly overlook it it on their way downstairs or out of respectful deference to Doghouse Saloon's disabled patrons. 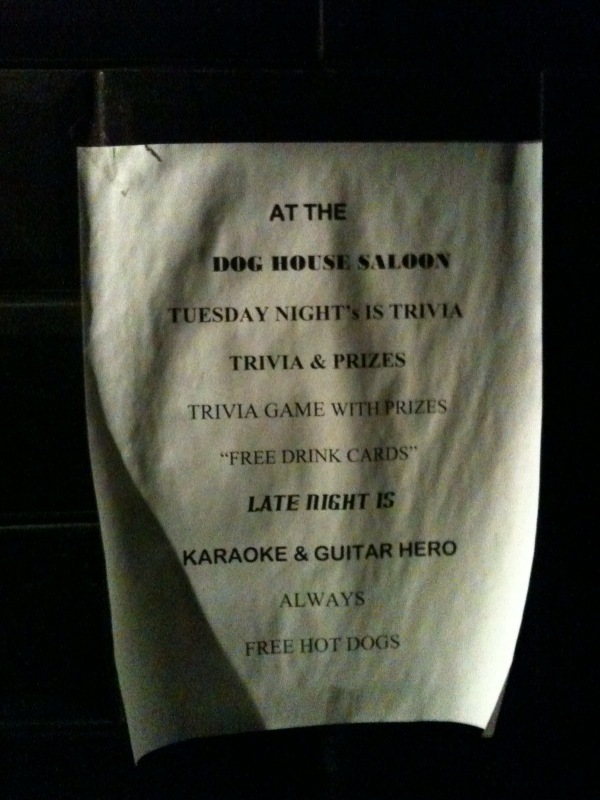 Keep in mind that it's called The Doghouse Saloon and it's in the LES though, so we'll leave it up to you to figure out which it is. Takes credit cards? - dear God yes. As a brand new, enthusiastically fratastic bar in the LES (with considerable sq. footage) this place would be foolish to turn down any form of currency, whether it be credit, traveler's cheque, piggy bank, Argentinian peso, piano lesson coupons or X-Men comics from the 80's. Crowded on weekends? - ummm, yeah....and with a name like The Doghouse Saloon, a million NYC hipsters already disapprovingly assumed as much. It's perversely fitting in a way that this place is back-to-back with Ludlow Street's own B&T oasis Libation, because in much the same way that Orchard St. is the poor man's Ludlow St., Doghouse is the Sidekick to Libation's Blackberry Storm. Seating - an abundance of stools by the main bar, two large booths in the back. Roughly the same situation downstairs. Upstairs has been christened as the "VIP Area" which Visceralist wasn't welcome at the night we went here, but we were sort of peeking up at it on the sly from the ground floor...it looked like there were 5 or 6 tables up there, but then the bouncer caught us and told us to stop looking up there like Nigel Tufnel with that one guitar, so we had to stop. Pretentious/assholes - Barrel, meet my friend Fish. Fish, meet my better friend Chrome Desert Eagle. Cost of Stella - $6...Visceralist has nothing for this, so commenters, go nuts. Best comment will appear here. What time people start showing up - ok, full disclosure, Visceralist came here for the first time last Friday from like 10 - 12 and has no plans on ever going back. It was basically dead at 10, but did wind up getting lively and vivacious at around 11:30. Whether or not this is true most nights or if this place gets more brolic as the night progresses is up to the commenters or Yelpers to speak on. Bartender efficiency - in a word, hysterical. There were 3 pros & 1 rookie working that night. Now, according to their website, they offer guest bartender nights so it's possible that the rook was a guest for the night, but given how new this place is, it was really hard to tell. Either way, the rook was the only one actually working while the others were listlessly cavorting and capering and generally dilly-dallying. Or maybe it was just that they were ignoring Visceralist on purpose (wouldn't be the first time, definitely won't be the last). Either way, the negligence was to the point that it was comical and well, now we're putting them on blast. That's how that goes. Official Website - here. Their homepage has an "index.html" at the end of it. If that's too inside-baseball of a diss for you, then watch this: they've decorated said homepage in what looks like Clip-Art from the 50's. If it's still like we're speaking Tagalog then consider this: they have the following in the footer of every page on the site: "Doghouse Saloon NYC is the newest bar to hit the city. A fun environment with a free hot dog with purchase of any drink. Stop by to see the large two floor bar area with an upstairs game room, 10 TVs that show all sports games and beer pong tournaments. Located close to Rivington on 152 Orchard Street, New York, NY 10002. Doghouse NYC. " Guy:girl ratio - they have a Wheel O' Shots here (with "water" on one of the tabs), so you can surely imagine how many women love coming here all the time, like nonstop infinity. Harder to gauge when it comes to the men-folk tho. Toys - Billiards, Skee Ball, Buck Hunter, and most importantly, Beer Pong. Yes ma'am. Mothers, free your daughters. Professor Snodgrass, we're serving you notice...school's out for summer! The Doghouse Saloon has sent out the Close Encounters of the Third Kind quint-tone, and Richard Dreyfus has arrived with a keg over each shoulder! Excitement! Intrigue! Arguments over whether bounce-ins (and you're gonna get bounce-ins) count! Beirut! Age of clientele - old enough to irreverently procreate. Shouts out to this. Space for dancing? - yes on the main floor and, if memory serves, downstairs. DID YOU KNOW! That the Courtney Cox "Dancing in the Dark" dance is not only alive, not only well, but flourishing and doing pre-2008-Madoff business? ID Check Procedure - yeah, pretty on-point too. Music medium, style & volume - suppose this is a good time to mention that this place used to be a somewhat-respected LES live indie-music venue called The Annex. Visceralist was considering pointing this out earlier, but really, The Annex was never all that. Never on par with like Pianos or even The Delancey. It was decent for what it was, but we don't think BrooklynVegan or anyone really shed a tear when this place shut down (shouts out to Rothko). At The Doghouse Saloon they have a DJ and, not sure if this is representative, but they did play the full album mix of Fatboy Slim's "Rockefeller Skank." Specials or most popular drink - they have a bunch of specials listed on their web 0.5 site, but we can't be bothered.